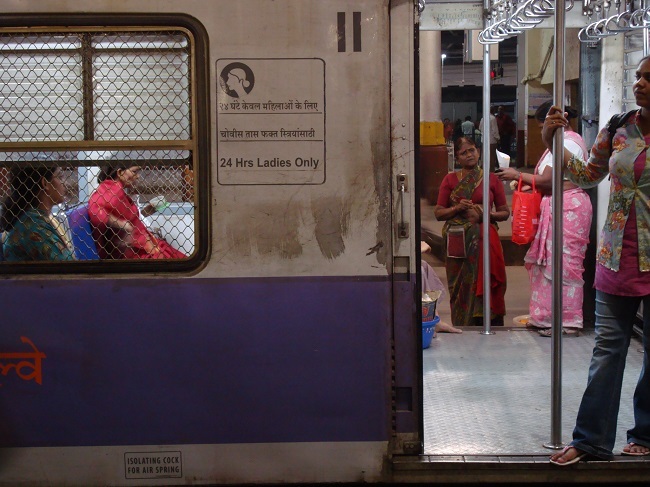 Separate subway cars allow women safe access to transport in Mumbai, India. Photo by ezola/Flickr. Disrespect to women in any form is unacceptable, including while using public transport. While the long term solution to this disrespect relies on educating people that this behavior is unacceptable, in the present, transport systems designed to promote positive social interactions between men and women can provide a key space in which to work towards making the urban environment safer for women. However, such systems will likely require infrastructure investments beyond the means of many cities, meaning we are still stuck in an age where hundreds of woman and girls experience “unwanted sexual attention” on public transport each day. Today, many different campaigns around the world aim to improve women’s safety on transport, many of which do so by separating them from men. While not without its flaws, this may be the best way to protect women in the short term while working towards large-scale societal shifts how women are treated in public spaces. Before Tokyo introduced women’s-only rail cars in 2005, there were reports that nearly 64% of women ages 20 to 30 had been groped in subway train cars. Given the otherwise sterling reputation of Tokyo’s extensive subway system, this sent a ripple through the transport community. Elsewhere, complaints in India prompted the creation of women’s-only buses in Mumbai and bus rapid transit (BRT) buses in Ahmedabad, Indore, Bhopal, Surat and Rajkot, all reserve space in the front of the buses for women. In Mexico, Mexico City’s metro and Metrobús BRT and Guadalajara’s light rail and Macrobús BRT also include separate spaces for women. Some may say this separation is discrimination. But today we find women abused in packed buses and trains in megacities, and they are not getting the protection they deserve. In many cases, they feel too ashamed of being taken advantage of that they do not say something or report what they experienced as a crime. The separation of spaces provides women the same basic transport services that men receive without threat to their physical integrity. There are still many operational problems with these solutions: how to make sure separate spaces are respected, the need for signals and special infrastructure, loss in overall capacity of the system, and increased costs. There is also the issue of last mile connectivity – allowing women to travel from transport stations to their homes – where well-designed and illuminated spaces are needed to provide security. Finally, the system often breaks down when there is no one to enforce it. Late at night, women often have no one else around to see a man step over a painted line on the floor, or step onto a train with only one other female occupant. Furthermore, the system does not work when separate is not equal. One mistake is the designation of special buses – commonly known as “pink buses” – because they may not provide the same basic service. They are usually less frequent, increasing waiting time for women, and at the end of the day prohibit the system as a whole from providing quality service. Separation with equal access is preferred, and as always, there should never be anything forcing women to choose women’s-only transport options. It is also essential to remember that policies keeping women separated can only be considered the start. They do not replace the necessary cultural shift in education and respect for women’s bodies. This opinion piece was originally published in Spanish at eltiempo.com.